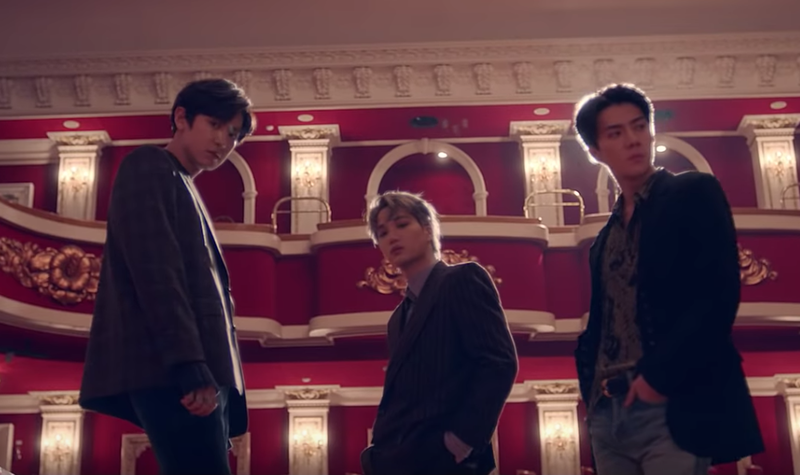 A few weeks after the release of their last single “Tempo,” EXO made their comeback on December 13 with “Love Shot,” a catchy and mysterious track fronting the repackage of their fifth album. In the music video, the members were seen in an elevated version of the trendy, eye-catching outfits seen in “Tempo.” While the members continued to mix menswear pieces with more casual ones to create a unique, daring image in the former, the outfits seen in “Love Shot” appear sleeker and more sensual, perfectly matching the tone of the latter song. In the video, the members are seen in three sets of outfits: one edgy and more casual, another adventurous and more polished, and one that seems to lie in between the two styles. In the first set, most of the members are seen in some kind of jacket, a t-shirt or sweater, and pants, with a mix of colors and accessories that add dimension to their ensembles. For example, Baekhyun can be seen in a black bomber jacket and gray t-shirt paired with red pants in a leather-like material, featuring metal studs on the legs. In the background, several other members can be seen sporting metal accents on their clothes as well. For example, Sehun can be seen with a metal chain hanging from his patterned blazer, and Kai appears in a metal choker. The subtle nods to Western wear—Kai’s all-denim outfit or Baekhyun’s leather pants to name a couple—supplement the aesthetic of the video, where the members are seen wielding guns and gambling in a high-stakes game. Additionally, the overall ruggedness of the outfits aligns well with the rest of the scene, which takes place in front of an abandoned gas station late at night. The second set of outfits shows the members in suits. However, these are no ordinary suits; the members are seen in different vibrant colors, with some, like Chanyeol, Baekhyun, and Kai, appearing shirtless underneath their jackets. Additionally, the members wear Chelsea boots instead of traditional dress shoes—either white ones or ones that match the color of the suit. The neat structure of a typical suit is challenged by the ways the members deviate from it, adding nuance and a touch of edginess to the overall look. Once again, the outfits match the setting of the scene well, appearing polished yet mysterious against the background of an empty palace-like building. The third set of outfits meshes elements of the first two, borrowing elements of menswear and winter fashion and pairing them with metal hardware. For example, Chen can be seen in a navy blazer with bronze buttons, paired with a red and navy blue sweater and multiple chains around his neck. Later, members Chanyeol, Kai, and Sehun can be seen in similar outfits, pictured in the center of the same empty, Wild West-inspired theater Chen was in earlier. Later on in the video, the members can be seen in another variation that seems to mesh elements of the first two outfit styles, pairing structured, more elegant pieces with bold, daring accents. The three types of outfits seen in the video come together to create a look that elevates EXO’s image, setting them up perfectly to fit a concept that’s mature and alluring, yet avant-garde and exciting at the same time. Which of their outfits was your favorite? Let us know in the comments below!